If Daniel Kitson is not an actor, as he notes in the beginning of his one-man show It's Always Right Now, Until It's Later - now having its American premiere at St. Ann's Warehouse in Brooklyn - he is definitely a master storyteller, offering an engaging, involving and enthusiastic approach to his tale of two very different individuals in a journey toward love, death and everything in between. The two people in question are William Rivington and Karen Carpenter, Kitson examining specific moments in their lives, including the time Karen broke her nose racing a bike down a hill at the age of eight, and a rather abrupt blind date for William at age 39. This is not a love story about William and Karen; the two meeting only once, and then only quite briefly. But the play definitely is, as Kitson explains, "a story about love". Other moments examined during this journey include marriage, infidelity, death of loved ones and the beginning of relationships; including a lifelong friendship which began in a graveyard. 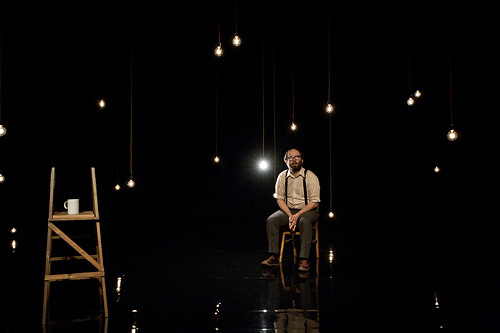 Kitson moves between these various situations via a stage filled with a dangling forest of lights, each one representing a specific instant in either Karen or William's life. What makes the play come alive, and William and Karen's stories so interesting, is Kitson's easygoing and congenial method in imparting these two tales. His disarming manner easily drawing the audience into the action and making every situation feel quite real. Kitson also tells the story as an impartial narrator, never assuming the personas of the various characters he speaks about - several in addition to William and Karen. In a nice touch, Kitson also frequently breaks the fourth wall, talking directly to the audience when he flubs a line, if a technical issue emerges (i.e. a light not working) or while explaining some terminology which may not be familiar to American audiences - some of the terms in question being "eggy bread" (French toast) and "ladybird" (ladybug). The show originally premiered at the 2010 Edinburgh Festival and later appeared at London's National Theatre. It's Always Right Now, Until It's Later also has a powerful circular finality to it with Karen and Richard's lives going in opposite directions. One of the story threads beginning at the moment of death and going backwards; the other starting shortly before birth and moving forward. This method offers poignancy on both ends of the chorological spectrum. In one case those watching know what has already happened as aged cynicism is replaced by dreams of the future; while in the other, the person gains wisdom with experience which they then pass on to the next generation and which also gets passed back to them. An ongoing mention of what is "normal" is used to highlight that idea in the latter timeline. The work is nicely paced throughout, with flashes of humor and insight mixed in with the ebbs and flows of various emotions, the different moments moving with almost a fluidic feeling from one situation to the next. It also helps that, thanks to Kitson's presentation and delivery, the audience quickly becomes quite willing to follow him wherever the stories lead.